Ike-Jime is Japanese fish killing technique. In general, Japanese technique is the most advanced in the world, although Australia and New Zealand are pioneering fish anesthetics that advance fish killing even more. Two reasons to care about how your fish are killed: proper technique insures the best quality fish, and is the most humane. Three years ago I wrote a series of posts on Ike-Jime and fish anesthesia. Since then, I’ve had the opportunity to perform many side-by-side taste tests between fish killed different ways, and was recently able to visit Tokyo’s Tsukiji Market to see more experts at work. The less trauma a fish goes through before and during slaughter, the higher the quality of the meat. Simple as that. For the nitty-gritty, see the annotated list of references following this post. Compared to red meat and poultry, fish muscle is delicate. It needs all the structure it can get. So unlike red meat, where we like a little protein breakdown to enhance tenderness, anything that breaks down the structure of fish muscle is bad. Stress causes fish muscle tissue to break down. Stress before or during slaughter –whether from overcrowding, struggling in a net, being lifted into the air, fighting on the end of a line, or even the long term stress from poor aquaculture practice– results in more exhausted fish. The muscles of exhausted fish have a lower pH (due to lactic acid production in the muscle). That low pH enhances the action of enzymes present in the muscle that break down protein. One study even claims that stress increases the amount of those enzymes present in addition to making them more effective. Higher stress also leads to more stress-related compounds in the blood, which some studies show degrade muscle. Finally, tired and stressed fish have less available ATP in their muscles. ATP is the energy source that makes biological systems run. After an animal dies, its muscles remain pliable for as long as it has some reserves of ATP. Once the ATP is used up, the muscles tense and will not loosen up –this is called rigor-mortis. 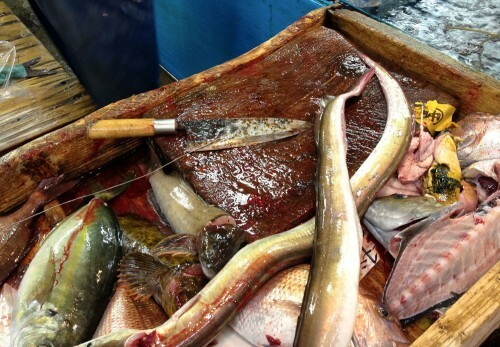 Rigor-mortis in fish can be strong enough to rip apart the connections between muscle fibers, leading to mushy meat. Muscles from stressed fish with low ATP reserves go into rigor-mortis faster and harder than muscles from rested, unstressed fish with more ATP. Eventually rigor-mortis contractions soften as the connections between the muscle fibers break down. Even if you decapitate a fish, the muscles in its body might continue to undergo stress due to the action of its autonomic nervous system. The autonomic — or involuntary — nervous system keeps running even if the brain is absent. The spinal cord keeps sending messages to the muscles. The muscles continue to use ATP, and the fish goes into rigor faster and harder than if we stopped those messages by destroying the spinal cord. You can destroy the spinal cord by running a thin wire along the top of the spine through the cord. Spinal cord destruction is especially important in Tuna: these fish can regulate their body temperature, unlike the vast majority of straight-up cold-blooded fish. Many commercial fisherman say that a tuna’s autonomic nervous system still attempts to regulate its body temperature even after death –so unless you destroy its spinal cord it heats up and loses ATP — double bad news. This is a bluefish head. A. Find the soft spot. This is where you should spike the fish. B. here is a cut-away showing the location of the fish brain. C. A full cut-away showing the position of the needle in the spinal column. On the left is a cross-section view showing the spinal cord versus the blood vessels. In the real life, you wouldn't stick the needle in this side --towards the head, but the other --towards the body. In the tail section of the fish, the blood vessels converge into one bundle. Good fish killing starts before you kill the fish. Rested fish are better that unrested fish. One study showed that fish netted from the ocean (very stressful) that were allowed to rest overnight in tanks and killed individually were much higher quality than those who were left in the net to die by suffocatation. Even better: start with rested fish and knock them out with an anesthetic. The anesthesia of choice for fish is iso-eugenol –one of the main components of clove oil. The commercial version of this product is called Aqui-S, and is a great product. It is being studied worldwide and has been used for quite some time in New Zealand and Australia. It is economically feasible for many farmed fish applications. At home you can use a mixture of clove-oil and high-proof liquor to knock out fish. Almost every study on the effect of anesthesia on fish has shown a positive impact on fish quality, and his technique is clearly more humane. I can post more on making your own fish anesthesia if anyone is interested. As soon as a fish is pulled from the water it should be dealt a death blow. Traditional technique is a sharp whack to the head –not such a good technique. Blows to the head are prone to error, and they don’t kill, they stun. Standard Japanese Ike-Jime technique on small fish involves severing the spinal cord and blood vessels between the head and the body –an OK technique as far as preserving fish muscle goes, but not so humane. This is the technique I have used for years but no longer recommend it. First, unless your fish handling is really good you are apt to have mishaps while trying to sever the spine –I’ve had fish hit the floor. Second, when you cut the cord the head ain’t dead. I’ve heard many people say that all the twitching and breathing is just “nerves reacting.” I have seen no data to support this claim and instead I assume that fish heads continue to take in sensory input after decapitation. In my opinion, the best technique is to shove a spike into the brain near the soft spot above the eye and back into the brain. Brain spike is quick, easy to master, and assures death. Good bleeding is essential to the look and taste of fish muscles. Some studies show that compounds in the blood of some fish actually also soften muscle (a bad thing). In the Japanese technique, severing the spinal cord and the two major dorsal blood vessels initiates the bleeding of smaller fish. You then sever those same vessels at the tail. Later on, you put the fish in salted water to complete the bleeding. In larger fish, like Bluefin tuna, it isn’t practical to sever the spinal cord at the head, so cuts are made near the pectoral fin where there are major blood vessels near the surface. The more I think about the normal Japanese bleeding technique, however, the more doubts I have about whether it is best. The Japanese technique severs both arteries and veins at the front and the back, totally disconnecting the heart from a portion of the circulatory system. Wouldn’t standard gill bleeding, which severs the circulatory system right before the blood returns to the heart, be better at allowing the heart to pump all the blood out of the fish? Interesting question. Spinal Cord Destruction (SCD) is the step where you run a small wire through the spinal column to destroy the autonomic nervous system. You’ve done it right if the fish shimmies as the needle goes through the spine. No shimmy? You did it wrong. Run the wire only once: don’t keep moving the wire up and down to make the fish move more– extended shimmy-ing depletes ATP, which you are trying to preserve. In smaller fish, you have two options for destroying the spinal chord: needle from the front, or needle from the back. In fish that you decapitate (or nearly decapitate), coming from the front is easier because the spinal chord presents a bigger target near the head. For fish you don’t want to, or can’t, decapitate, go in from the tail. When severing the vessels at the tail or when decapitating, it is good practice to not remove the tail or head completely, because you can use them as a handle when you shove the needle in. In big fish, like tuna, it is customary to insert the needle through the head and into the spinal cord (which is called the Taniguchi method). You make a small hole in the skull of the tuna above and between the eyes, and feed a length of monofilament line or stainless wire through the head and into the spinal column. Traditionally, if a fisherman uses monofilament they leave it in the head so buyers know the tuna was treated right. Theoretically, the brain cavity forms a funnel that guides the needle into the spinal column. I tried this method on bluefish head but I didn’t have any luck. The needle was stronger than the back of the skull and went through the muscle instead of going in the spinal column. Maybe tuna skulls are made of sterner stuff. All research points to the importance of immediate gutting. Ain’t nothing good coming outta leaving the guts in. Filleting is a different story. If you fillet before rigor, the muscles will not be damaged as much (because they won’t have the skeleton to react against), but the fillets, aside from being firmer, will be smaller and denser. I prefer to eat fish after they go through rigor mortis. Pre-rigor fillets are almost crunchy when eaten as sashimi. If you do like pre-rigor fish, Ike-Jime+SCD is the optimum technique because it increases the window you have to serve the fish in a pre-rigor state. For people like me who prefer post-rigor fish, Ike-Jime+SCD delays rigor substantially, so fish killed this way aren’t ready to eat as quickly as fish killed using typical western techniques. When Ike-Jime+SCD fish do come out of rigor, however, they are much better than western-killed fish. It takes practice to figure out how to time the killing of different fish. Some fish are best after one day, some after two or more. When eaten as sashimi, the benefits of Ike-Jime are clear. The more you cook the fish, the less obvious the benefits. He kills and performs SCD on several different types of fish –including a Hamo (pike eel), which he needles in the body and the head (to prevent it from biting him). I didn’t seem him do any brain spiking, and I didn’t see him use water for bleeding. Not much. Unless you are a commercial producer or a fisher-person, there are few opportunities to practice good Ike-Jime. A home cook or a restaurant can buy live fish, but few people have the ability to keep those fish truly rested and get the best results from proper killing technique. But we should all be aware of good practice –and ask for it, so our purveyors and distributors know we are willing to pay the price for fish that have been treated properly. Thread on Tuna Killing at 360tuna.com: especially look at the longer comments by DenisB. Thread on Knife Forums: check the comments by Loup Garou. Quality and quality changes in fresh fish: from the FAO (thanks to @acephalopod for this link). Great information; section 5 is especially salient. Looking After Tuna: from the New Zealand Game Fishing people. Step by step. Influence on Post-mortem Rigor of Fish Body and Muscular ATP Consumption by the Destruction of Spinal Cord in Several Fishes. Masashi Ando, Akira Banno, Michio Haitani, Hideaki Hirai, Takayuki Nakagawa, Yasuo Makinodan. Fisheries science Vol. 62 (1996) No. 5. This is the first paper I read when I got interested in fish killing a few years ago. It gives the basics. It also mentions previous research claiming that ATP is consumed slower at 10C than at 0C, so the onset of rigor is accelerated by the premature icing of fish (the study was on sea bream, not tuna, where premature icing is a known bad practice). Influence of death struggle on the structural changes in chub mackerel muscle during chilled storage. Interesting paper claiming that normally non-sashimi quality fish, like chub mackerel, can be made into sashimi quality fish (with a consequent increase in value) if proper slaughter conditions attain. Change in Rigor Mortis of Red Sea-Bream Dependent on Season and Killing Method. Teruo Nakayama, Naoko Ooguchi, Atsushi Ooi. Fisheries science Vol. 65 (1999) No. 2 The title pretty much explains it. Observation of Characteristic Muscle Structure Related to Delay in Red Sea-Bream Rigor Mortis by Spinal Cord Destruction. Teruo Nakayama, Eiichiro Goto, Atsushi Ooi. Fisheries science Vol. 62 (1996) No. 6. Shows that quality is better in unstressed killed sea bream vs stressed sea bream and even better in unstressed spinal-cord-destroyed sea bream. Proposes that two separate mechanism are at work: 1. Stressed fish go into early, stronger rigor than unstressed fish, and strong rigor destroys muscle structure; and 2. Stressed fish have a lower pH than unstressed fish which enhances proteolytic enzyme activity, destroying muscle structure. Trials for keep the fish muscle quality during chilled storage MASASHI ANDO, YASUTAKA SHIGEMURA, YASUYUKI TSUKAMASA, YASUO MAKINODAN. Fisheries science Vol. 68 (2002) No. 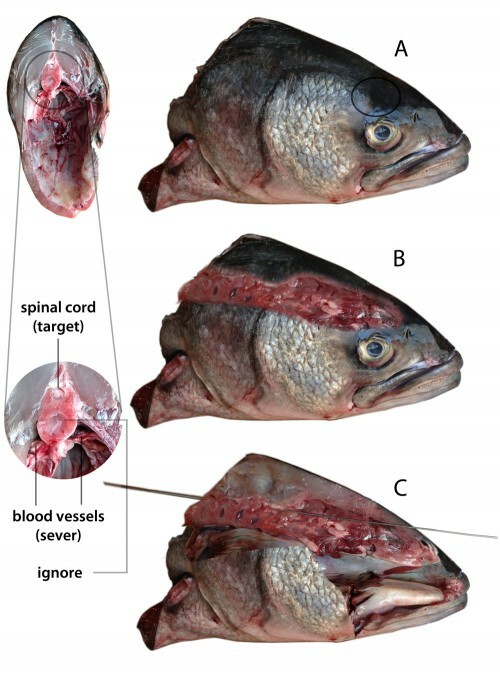 sup2 Makes the claim that Spinal Cord destruction and bleeding has different effects on different fish, drawing a distinction between pelagic fish (swimming near the top of the ocean) vs demersal fish(swimming on or near the bottom). Yellowtail (pelagic) and Red Sea Bream (Demersal but a swimmer) showed delayed rigor (which is good) with spinal cord destruction, whereas plaice (demersal and a true bottom dweller) went into rigor faster with SCD (bad). In yellowtail, horse mackerel, and striped jack (pelagics), proper bleeding kept the flesh firmer, while in red sea bream, plaice, and rudder fish (demersal), it did not. The intro points out that regardless of type, bleeding is necessary from a look-taste perspective in sashimi. Influence of death struggle on the structural changes in chub mackerel muscle during chilled storage. MASASHI ANDO, MASAO JOKA, SATOSHI MOCHIZUKI, KOH-ICHI SATOH, YASUYUKI TSUKAMASA, YASUO MAKINODAN. Fisheries science Vol. 67 (2001) No. 4. Points out that many fish that are low-priced might become high-priced fish if treated better during catch procedure. Study shows that chub mackerel that are rested overnight after capture and then individually slaughtered have firmer flesh than those caught in nets and allowed to struggle to death. L. Ribas, R. Flos, L. Reig, S. MacKenzie, B.A. Barton, L. Tort, Comparison of methods for anaesthetizing Senegal sole (Solea senegalensis) before slaughter: Stress responses and final product quality, Aquaculture, Volume 269, Issues 1–4, 14 September 2007, Pages 250-258, ISSN 0044-8486, 10.1016/j.aquaculture.2007.05.036. Clove oil anesthesia vs. ice-slurry anesthesia vs. asphyxiation. Clove oil wins. Addis, M. F., Pisanu, S., Preziosa, E., Bernardini, G., Pagnozzi, D., Roggio, T., . . . Terova, G. (2012). 2D DIGE/MS to investigate the impact of slaughtering techniques on postmortem integrity of fish filet proteins. Journal of Proteomics. Shows that reducing slaughter stress actually lowers the amount of protein degradation in fish, even when measured immediately after slaughter. Pre-slaughter stress accelerates anaerobic energy metabolism,and therefore produces a rapid increase in muscle lactic acid production(Poli et al., 2005). In the present study, salmon subjected to pre-slaughter long-term stress (LS) presented the lowest muscle pH immediately post-mortem and over the whole storage period. Our results agree with several other studies, which also showed a lower muscle pH immediately post-mortem or a higher lactate level in stressed fish than in unstressed ones (Bagni et al., 2007; Erikson, Beyer, & Sigholt, 1997; Erikson & Misimi, 2008; Lowe et al., 1993; Stien et al., 2005; Tejada & Huidobro, 2002; Thomas et al., 1999). The strong pH reduction in long-term stressed salmon immediately after slaughter may suggest an in vivo accumulation of lactic acid in the muscle, because long-term stress induced strong swimming activity and presumably a very slow release of lactic acid from the cells…. Our results on enzyme activities indicated that pre-slaughter stress increases cathepsin B total activity in the muscle, even if these results were not significant. 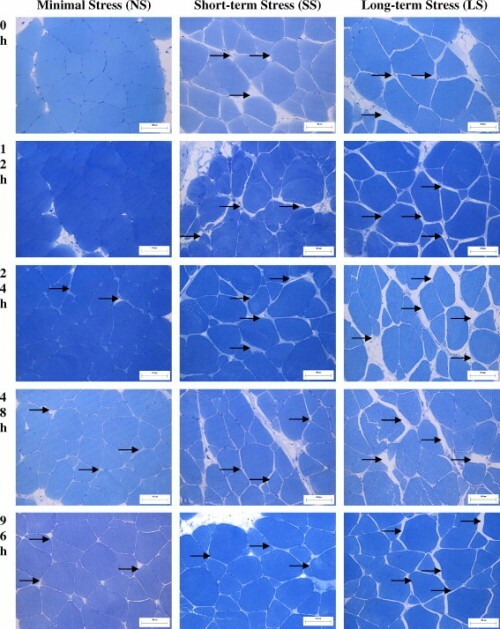 Long-term pre-slaughter stress also enhanced significantly cathepsin L gene expression in the muscle, and a similar trend was seen for cathepsin B. These results agree with studies on rats and mice where, under stress conditions, cathepsin total activity (Pote & Altekar, 1980; Vihko & Salminen, 1983) or cathepsin gene expression in Atlantic salmon (Bahuaud et al., 2009) increased in the muscle. S Yue, R.D Moccia, I.J.H Duncan, Investigating fear in domestic rainbow trout, Oncorhynchus mykiss, using an avoidance learning task, Applied Animal Behaviour Science, Volume 87, Issues 3–4, August 2004, Pages 343-354, ISSN 0168-1591, 10.1016/j.applanim.2004.01.004. Although the article uses the highly charged word “fear,” it demonstrates that fish can learn to avoid noxious stimuli by remembering a temporal connection between a non-noxious warning stimulus and the noxious follow-up. I.e., there is more going on in a fish brain than reflexive reaction. Elisabete Matos, Amparo Gonçalves, Maria Leonor Nunes, Maria Teresa Dinis, Jorge Dias, Effect of harvesting stress and slaughter conditions on selected flesh quality criteria of gilthead seabream (Sparus aurata), Aquaculture, Volume 305, Issues 1–4, 1 July 2010, Pages 66-72, ISSN 0044-8486, 10.1016/j.aquaculture.2010.04.020. The use of anesthesia on Sea Bream. Anders Kiessling, Marit Espe, Kari Ruohonen, Turid Mørkøre, Texture, gaping and colour of fresh and frozen Atlantic salmon flesh as affected by pre-slaughter iso-eugenol or CO2 anaesthesia, Aquaculture, Volume 236, Issues 1–4, 14 June 2004, Pages 645-657, ISSN 0044-8486, 10.1016/j.aquaculture.2004.02.030. Title says it all. Iso-eugenol wins. Anders Kiessling, David Johansson, Inger Hilde Zahl, Ole Bent Samuelsen, Pharmacokinetics, plasma cortisol and effectiveness of benzocaine, MS-222 and isoeugenol measured in individual dorsal aorta-cannulated Atlantic salmon (Salmo salar) following bath administration, Aquaculture, Volume 286, Issues 3–4, 17 January 2009, Pages 301-308, ISSN 0044-8486, 10.1016/j.aquaculture.2008.09.037. Shows that plasma cortisol levels, an indicator of stress, is increased by the administration of anesthesia, including clove oil. Thus even though anesthesia seems to lower stress related meat quality problems, it isn’t stress free. Bjorn Roth, Sveinung Birkeland, Fernando Oyarzun, Stunning, pre slaughter and filleting conditions of Atlantic salmon and subsequent effect on flesh quality on fresh and smoked fillets, Aquaculture, Volume 289, Issues 3–4, 16 April 2009, Pages 350-356, ISSN 0044-8486, 10.1016/j.aquaculture.2009.01.013. Shows that less stress equals better fish but you can’t tell if you overcook it (duh). Also discussed pre-vs-post-rigor filleting. Awesome post! Original content, peer reviewed research, Simpsons clip, and the Ryugin chef w/ another innovative use of technology! Oh my! Don’t leave us hanging — what should we have on the stereo when we blow out your spinal tissue? Great article Dave. I think we all need to do a side by side taste test now. I wonder if my great grandfather administered ike jime to his fish since he would only eat fish that was brought to him alive. Very good article. I suspect a similar process occurs in porcine stress syndrome where an uncontrolled cascade of ATP use, lactic acid production and muscle rigidity all contribute to cellular breakdown and tissue degradation. Interestingly, a hereditary condition in humans triggered by certain anesthetic drugs exists. It is called Malignant hyperthermia and starts its cascade in the calcium channels of the neuromuscular junction. Lactic acidosis, muscle rigidity, increased temperature and CO2 production all lead to a potentially life threatening condition. The treatment (other than supportive care)is dantrolene which inhibits the release of ca++ from the sarcoplasmic reticulum in skeletal muscles. I have treated one case in 18 years as an anesthesiologist and thankfully she lived. Wow, cool info. I did A quick search. Doesn’t look like dantrolene clears quickly enough to be used as a zero-withdrawal agent for slaughter use to preserve ATP in animal muscle. Too bad. Here is a good review of MH, PSS and PSE. I have been interested in Pre-mortem stress, rigor mortis, chilling and their effects on fish and meat flesh quality for some time but as you say there is little opportunity for the home chef to experiment. I do think that there is more stress triggered tissue degradation in commercial meats (especially pork and fish) than one would be led to believe. Would love to discuss further when you are next in San Francisco. You might like to get in little field research hunting a wild pig at my place in Napa. Definitely would like some info on homemade fish anesthesia, please! Thank you so much for this post. Every bit of it is informative and riveting. I am glad you are back posting. This is hands-down the most enjoyable food-read. So how would this apply to an angler? We are by definition fighting fish, so they are stressed when they come aboard. Most of us knock them on the head, then put them on ice, and with sharks and rays we gut them ASAP. Is there anything else we can do to result in better quality fish? Thanks for this article, BTW. The only fish I’ve had done for me off a boat as a side by side taste test was striped bass(Dave Chang was shooting a TV show about it). The spinal cord destruction seemed to make a big difference. For a larger fish, I’d recommend a knock on the head to stun, plus an immediate brain spike to kill, followed by a gill cut and a tail cut, needle the spine through the tail. If you can practice on heads, You could figure out the through the head needle technique. Down here in Australia, ike jime has been appearing on menus at better restaurants for more than a decade now. What’s new, though, is the references I’ve seen in the past 12 months or so to “ike-jime squid”. What’s your take on the value of these techniques when they’re used on invertebrates? Sorry for posting here, but I couldn’t find a contact for a web admin. Shoot.Dunno what is happening. Will try and fix.